or Shastri with 50% Marks. (55% Marks for SC of Haryana Domicile). 2- Passed Haryana Teachers Eligibility Test (HTET)/School Teachers Eligibility Test (STET) Exam. 3- Passed Hindi/Sanskrit upto Matric Standard or 12th/B.A/M.A with Hindi Subject. 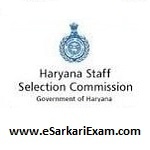 Eligible Candidates can Submit Online Application at the Official Website of Haryana SSC Latest by 25th March 2019. Applicants First Open to HSSC Official Website. Click on Adv 2/2019 Link at Home Page. Click on Continue to Registration Link in Visual Guide Section. Now Read Form Filling Instructions Carefully. Register by Clicking Proceed Button for New Registration.